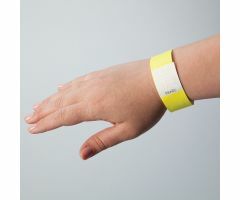 Tyvek® Wristbands are waterproof, tear-resistant and feature secure-adhesive closure. Bands must be cut to be removed. Numbered to provide control and accounting of patients, visitors, etc. Available in Blue, Neon Yellow, Red and White. Specify color when ordering.